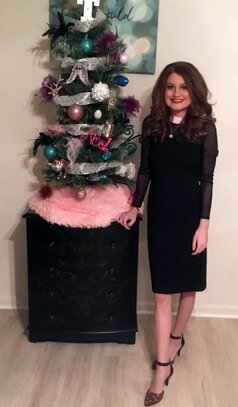 ​Despite not being home for the holidays, Kaelyn made the most of the season by decorating a tree in her North Carolina home and attending the Respiratory Care Ball with her friends and nurses. Kaelyn was admitted to the hospital for a few days after the doctors found a bump on her scar which was an abscess or infection. She stayed a few days, and while she was there she decorated other patient’s doors. ​of life she was given by both of her donors. ​At the end of September, Kaelyn found out she wasn’t going to be able to move back home yet - news she wasn’t wanting to hear. After learning she still had a little ways to go on her treatment plan and wouldn’t be returning home to Oklahoma, she remained hopeful and encouraged for what was to come. A few days later, she received a letter from the donor family of her first lung transplant and was encouraged to finally have a name for the person who saved her life three years ago. In October, Kaelyn went to the doctor because she wasn’t feeling well and two days later her symptoms were getting worse. The doctors determined Kaelyn had an aggressive infection which affected her breathing and her lungs. The infection was treated with antibiotics and they recently learned that she may have mild rejection, but will not know until she has a bronch and biopsy to confirm. After a 5 day IV treatment for rejection, the doctors believe her lungs might be better than they were before. Please keep Kaelyn and her family in your thoughts as they experience this temporary setback. Now that Kaelyn is able to live in her Durham home, she is getting stronger and making progress daily. She and her family were excited to celebrate her 25th birthday. She and her Durham friends and family went out to dinner to celebrate! Kaelyn had a great check up with her Pulmonary doctor at Duke, he was pleased with her progress. She has gained 14 pounds since arriving in Durham, and has approximately 10 more to gain to be at her normal weight which is still very small. All of her staples have been removed, and she will graduate pulmonary rehab this week! 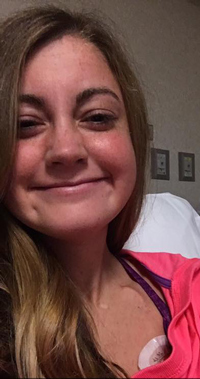 She will also have a bronch and biopsy on September 22, 2016, if she has no rejection or infection, she may be able to move back home to Oklahoma at the end of the month. This weekend, Kaelyn is going to Myrtle Beach for a few days to relax and sight see with her family and boyfriend. After walking two miles a day, Kaelyn has been discharged from the hospital! She and her family will spend time in their temporary home in Durham, NC while she continues to recover. Kaelyn is very thankful for her new lungs and happy to be outside the hospital walls for the first time in more than 50 days! Kaelyn continues to recover while she is staying at the hospital. She has had her chest tubes removed early this week, and has been walking several laps around the ICU. She found herself with an extreme amount of pain in her left chest when the doctors realized she has bleeding going on in her left lung. She had surgery to solve this issue and is already up walking laps around the unit. Today, she walked one mile without stopping! ​Kaelyn is making progress every day, and because her blood pressure has been dropping when she stands, today was the first day she’s been able to walk. In fact, she walked 1 lap around the ICU and hopes to walk again later this evening. Kaelyn is in great spirits and is fighting daily to get out of the hospital. After a long night, Kaelyn is out of surgery. The surgeons reported that the double-lung transplant went great and was just as expected. We are cheering Kaelyn on as she begins her recovery process post-transplant! Without selfless donors, lifesaving transplants like Kaelyn’s would not be possible. Thank you to all of the donor families who stand beside their loved ones decision to save lives. Kaelyn received a call this morning about a set of lungs and was told she would hear around 4 pm today if it was a GO or not. The LUNGS are good and she is getting ready to be transplanted with her new lungs. ​LifeShare is wishing you the very best and a speedy recovery. Between Kaelyn’s appointments with her doctors, she and her family try their hardest to have fun during their stay in the hospital. Beginning in 2013 before her first transplant, Kaelyn’s family started decorating her hospital doors, which brightened Kaelyn’s spirits along with the doctors and nurses who saw her often. Kaelyn and her family continue this tradition today while she is waiting for her second transplant. They bring their own sheets, blankets, pillows, decorations for their room and decorations for the door to brighten their spirits while they wait for another set of lungs. Kaelyn and her family have noticed how many people have enjoyed looking at her different door designs and hope they can continue brightening other patients days while they stay in the hospital through a simple act of a decorated door. Yesterday morning, Kaelyn received a call that she could potentially be receiving a lung transplant that evening. After a long day of waiting and fasting, around 11:30 P.M., Kaelyn and her family learned that the lungs were not a good fit for her. This makes the second time she has expected lungs that haven’t worked out, and is trusting that the third time is a charm! Kaelyn was diagnosed with cystic fibrosis at the age of 20 months. With the help of breathing treatments and daily medicine she was able to live a very normal life. Kaelyn was a cheerleader from age six through high school and continued to stay active. Then at the age of 22, she almost lost her life due to unexpected lung failure post-surgery for her gall bladder and kidney stones. She was rushed to Duke Hospital in North Carolina and put on the transplant waiting list. Her need for a transplant was so high; Kaelyn only waited a day and a half to receive the gift of life. Following her transplant, Kaelyn spent six weeks in intensive care and several more months in rehabilitation. For the first ten months, her body rejected the new lungs which required more treatments. During the life changing event, Kaelyn had a generous outpouring of support from her family and the community, which gave her strength and hope to move forward. ​Kaelyn became the face of the Oklahoma Driver’s Education program as she promoted organ, eye and tissue donation to new drivers making a decision on their license. Now, two years since her transplant, Kaelyn is facing a new but familiar battle. While visiting the doctor at a regular check-up this year, she was admitted to the hospital because of damage from antibodies and rejection she has had off and on. Kaelyn’s health is not what her doctors were wanting for her, and she was reevaluated for another transplant, and is officially listed and waiting for a new set of lungs. Kaelyn is praying that a donor is found soon and her body accepts the new lungs. She and her family have agreed for us to follow along with this part of her journey, the other side of organ donation and transplantation that many don’t see.